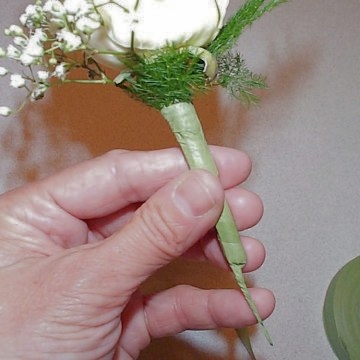 A classic white rose boutonniere is fairly straight forward. 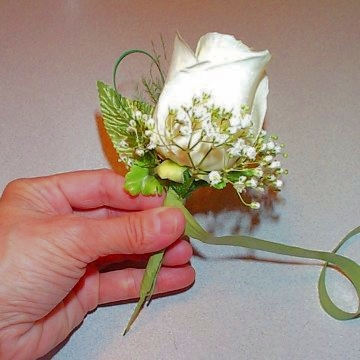 Wiring roses for use in corsages or boutonnieres is the same. 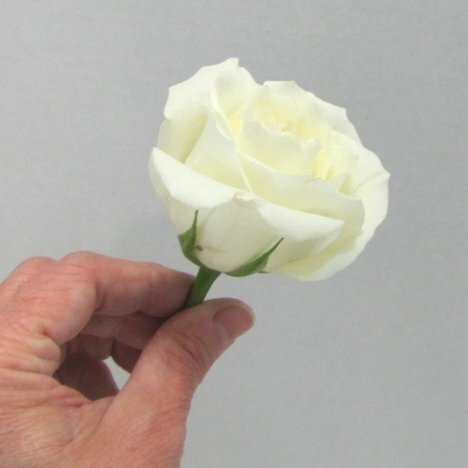 Wash your hands before handling roses - the oils on your fingers can cause bruising or discoloration on tender petals. 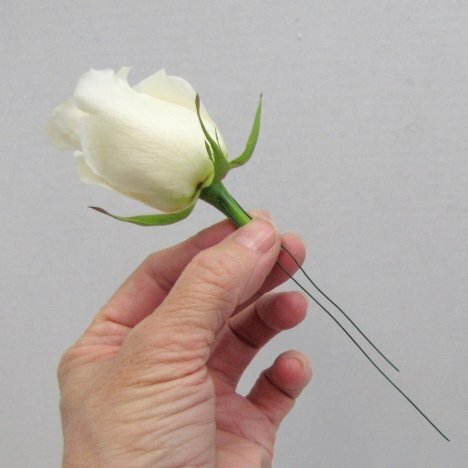 I will use a rose as an example, but the same techniques can be used for most any flower you choose. Before making any flower arrangement, allow the freshly processed flowers to hydrate completely in a bucket of Crystal Clear Flower Food treated with proper food nutrients. Clean off the stem of your rose of the thorns and foliage. Leave about a 2" stem (a little shorter if the stem is very thick). Push the wire thru the bulb of the flower (calyx) until not quite halfway through. Bend the wires down until they are parallel with the flower stem. (Creating a "U" shape with the wire). Corsage stem wrap is a product that will stretch and cling to itself, forming a tight bond around flower stems. 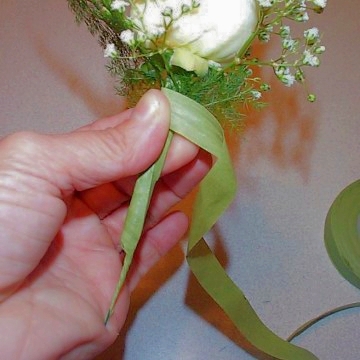 Using green tape, start at the top of the flower and cover the wire with tape. 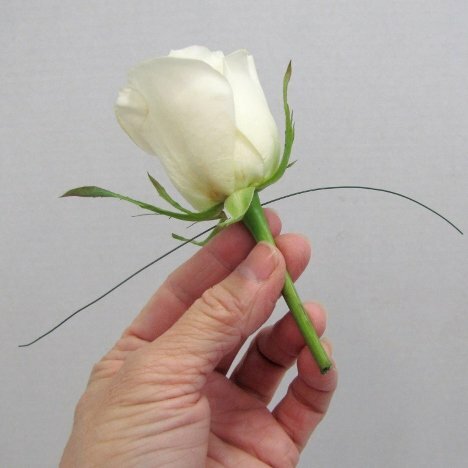 Pull the tape in a downward motion as you twirl the flower stem between your thumb and fingers. Pull downward until the whole stem and wire is taped securely. Your stem should be neat and taped completely to the bottom. 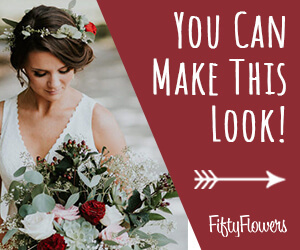 Now you are ready to add a little filler flower and touches of greenery. 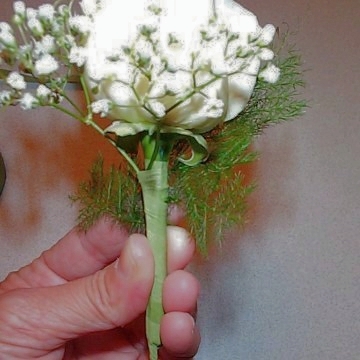 When you start to make corsages, don't get carried away with the filler flower and foliage. Too much and the focus on the main flowers will be lost. Tape pieces of filler flowers to the sides and back. You can put a little in the front - but be sure it isn't so much that it is too tall and conceals the main flower. 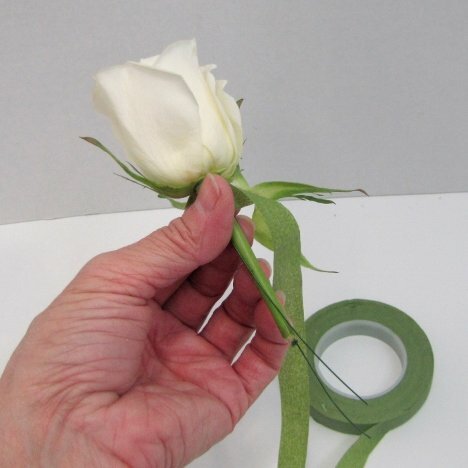 Begin taping filler by laying it close to the base of the rose. Tape as before. Tape feathery greenery (this is plumosa) to the back of the corsage. 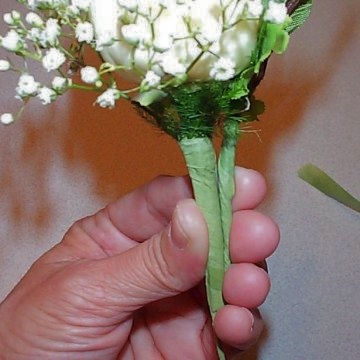 Wrap corsage tape and stretching so it clings firmly to the stem of the corsage. 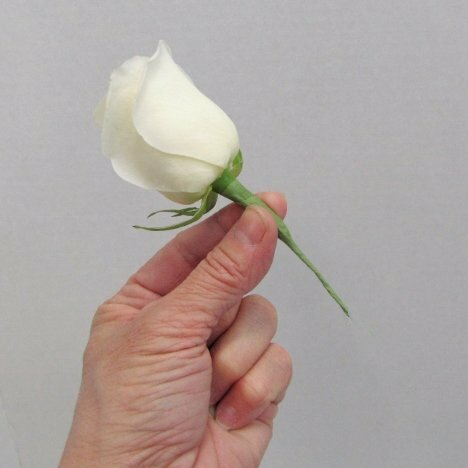 Once your stem is completely wrapped, you should have a neat flower with filler flower to the sides and a green filler in the back. I make corsages more interesting by using a couple of different types of corsage leaves. 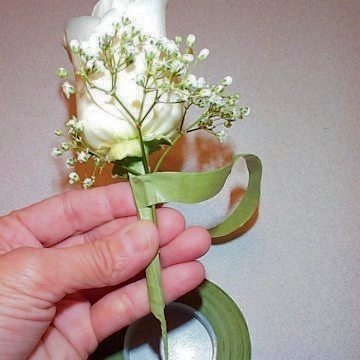 After taping a couple of stems of leaves together, lay them against the backside of your taped rose. You can add more interest by adding rhinestones, smaller flowers, loops of colored wire, etc. Here I'm adding a few loops of bear grass for interest.